Some of you may already be familiar with NuRide, a new (to Austin) program that rewards people for making choices that “green” your commute or daily trips. For those of you who aren’t, the easiest way I can think to describe it is as a rewards program for everyone who contributes to taking automobiles off the roads of Central Texas. Some resourceful Leander commuters have taken matters into their own hands. Several long-time Express route riders who normally catch the 986 and 987 from the Leander Park & Ride have formed their own adhoc carpools instead during the transit strike. According to Capital Metro outreach volunteers who were stationed at Leander Park & Ride yesterday and today to help riders find other ways to work, the carpools formed on site, made up of individuals who have been sharing an Express bus ride with each other for months. Leander Mayor and Capital Metro Board Member John Cowman volunteered to do outreach this morning, and was heartened by the resourcefulness of Leander residents to make lemonade out of lemons. In strike news, today Capital Metro was able to add three more bus routes and increase the frequency of buses from 45 to 30 minutes. The complete list of routes operating can be found on the Capital Metro homepage. Today was the kickoff event for Commute Solutions Month, which aims to raise awareness about the benefits of carpooling and mass transit. What fun! Part of the festivities was the Weirdest Commute contest. 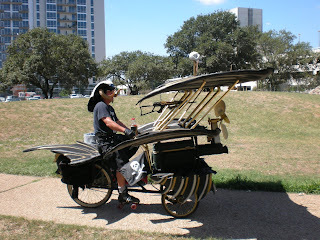 I had heard about the guy who rode a motorized bar stool last year, and he was back! The designer/owner was Mike, and he won second place and a Kona bicycle. For first place, Jeff won a pair of three day passes to the Austin City Limits Festival. During Commute Solutions Month, you can win some great prizes, too, by participating in the Commuter Challenge. September is Commute Solutions Month. Tomorrow is the official kickoff, and the Commute Solutions Coalition of Central Texas (Capital Metro is a partner) will be celebrating at Republic Square, 4th & Guadalupe, from 11 a.m. to 1 p.m.
Festivities include music from Austin Home Grown, food, information booths on commuting options, the UT cheerleaders, Austin Energy’s Cody the Clean Air Car, and more. A highlight of the event will be the Weirdest Commute Contest. Commuters with great imaginations and a tremendous sense of fun are encouraged to participate. 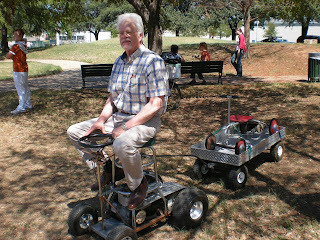 I’m sorry I missed the motorized bar stool last year. That’s my kind of ride. Judging will begin at noon and the winner will receive a pair of 3 day passes to ACL! Learn more about Commute Solutions Month and take the Commuter Challenge! This morning (and several days last week) Capital Metro staff were stationed at some key bus stops to help riders get on the right buses after the significant service changes that became effective yesterday. One of the outreach locations was the new South Congress Transit Center on Ben White west of Congress, whose central clock tower is reminiscent of Austin’s historic moon towers. The new facility has a kiss and ride drop off area and some limited parking (including motorcycles and scooters) for customers, with priority parking for RideShare carpoolers. Six routes serve the new facility: 1L, 1M, 9, 101, 328, and new route 202. Capital Metro plans to add more routes in the future. This morning, in addition to handing out Krispy Kreme donuts to celebrate the opening, Capital Metro staff directed riders to the correct bus bays and answered other questions. Some of the other amenities at the South Congress Transit Center include bike racks, emergency call boxes, vending machines, and native plant landscaping. As one of my favorite transportation planners here summed it up, “The facility looks really great.” Here, here! I hope customers like it, too.